(in folklore) a female marine creature,having the head,torso and arms of a woman and the tail of a fish. 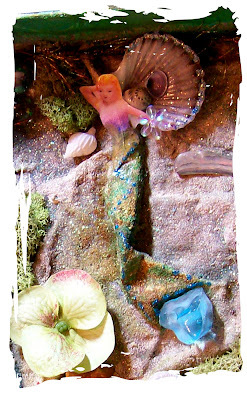 inside box - a mermaid diorama- shells from my travels, sea moss,marbles, sea glass, sand and glitter awash with Golden titan buff. I created the undulating sand with gel medium, beach sand and used dryer sheets. I did not initially intend to create what has become the mermaid's tail. I saw this once the bottom layer was completely dry and and realized all it needed was a head and torso. Viola! 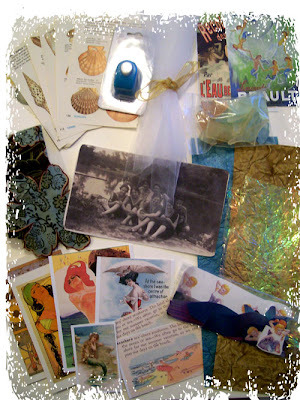 Here are some snippets of the ephemera that were included in her package. Have a swimmingly good day! Thanks for stopping. 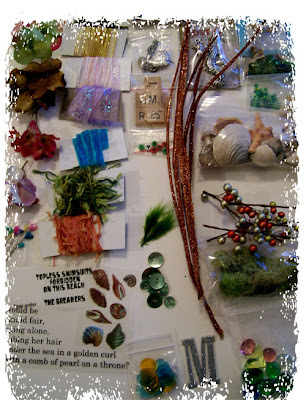 My other blogspot:"ThE ArTful EyE"
Hi Andrea - I just could not resist commenting! For anyone else reading this: I was the lucky recipient of Andrea's beautiful creations you have just viewed. Your photo's are great Andrea but I just want everyone else to know that they don't even begin to capture the enchantment of these pieces - The box just begs to be opened and to gaze inside is to enter another world! A mini vacation I have taken frequently the last few days! The Acrylic block sitting in my windo sill is like gaziing at a mini Cathedral window with a Mermaid instead of the MaDonna. Just lovely as the sun comes in the South Window!! This box looks so cool and well constructed. So much attention and care - impressive inside and out. The mermaiod tail is sort of like that bird you found as you worked on Replenish - very open to the flow. Althougth your photos are excellent, I am sure the box blows away this post's pics. I borrowed the goodies pics - kollobo.ation fodder. My best. I believe Heidi when she says that the pictures don't do your work justice - I think this would be even more amazing up close. I love the dryer sheet bit. You did a knock out job on this one!! I have to say that this is absolutely amazing and I can't believe what care and tenderness you put into making this, it is truly stunning and I am not exaggerating. I think the outside of the box and the inside of the lid are so beautiful. They are real pieces of art. Imagine having that sitting on your bookshelf and taking it down and handling it every day to look at it. I stand in awe, madam! I would love to be your swap partner!! Everything is so beautiful. Love the box wow really lovely!